Experience the colours, feel, and magic of Autumn and “Fall” in love with Niagara Falls, Ontario, Canada. It’s s special time of year, when the kids have gone back to school, and couples can have a more intimate getaway. Though you will notice longer evenings, you can still soak up the summer sun in September and watch as the leaves transition to stunning red, yellow, and orange hues in the lush Queen Victoria Park. Enjoy the breeze as you walk along the parkway and breathe in the fresh air of a new season. As the sweet days turn to cool nights, you have the perfect excuse to for a romantic dinner and a night on the town. Whether you need a weekend away from back-to-school stress or procrastinated on your summer vacation, Niagara Falls in September offers the perfect setting away from daily life, where you can appreciate natural beauty as well as world-class dining and entertainment. It’s that fleeting time of year before the frost kicks in, where you can witness the changing colours of nature under sunny skies and into the crisp evenings. With the summer humidity lifting, it’s one of the more refreshing times of year, ideal for foot tours of all the legendary attractions. What’s not to love? With so many sights and events, it can be hard fitting it all on. One of the best ways to make the most of your time during your trip to Niagara Falls is to visit the Skylon Tower’s Observation Deck, 775 feet above the Falls. This spectacular 360 degree view of Niagara Falls is unique to the Skylon Tower. Stretching as far as Buffalo, NY and Toronto, ON, you can feast your eyes on the Niagara River and Parkway, the Falls, and of course the city of Niagara Falls! In less than one minute, you can ride to the top and share this one-of-a-kind experience with the person you love. With indoor and outdoor decks, the weather is never an issue, so you can be free to take your time to live in the experience, create memories, and capture photos. Hard to step it up a notch from 775 feet, but the Skylon Tower has managed to do so with its Revolving Dining Room. The perfect way to treat your partner to a truly romantic and enchanting experience is to book your reservation now. You can savour award-winning continental cuisine served overlooking Niagara Falls. Every seat offers the same mind-blowing view as the dining room revolves 360 degrees each hour. Reserve after sundown to view the Illumination of the Falls, where Niagara is lit up with colours of the rainbow. Check here for information on events in Niagara Falls. Contact the Skylon Tower today and book your reservation. 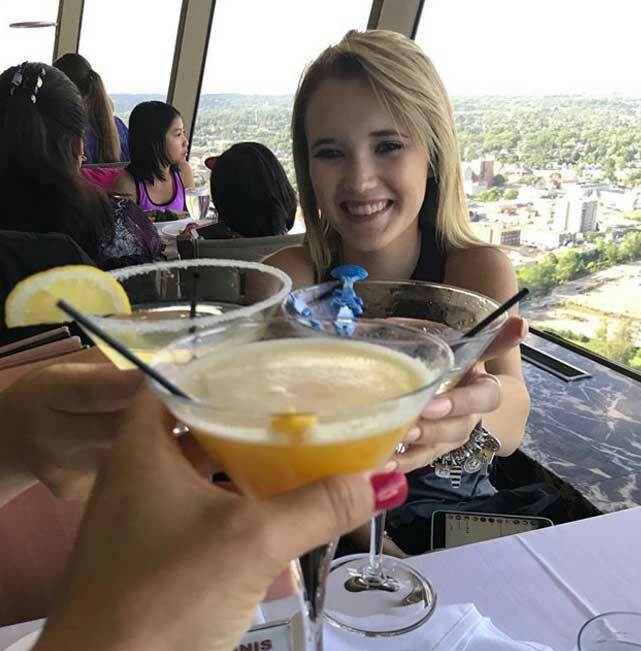 As an added bonus, your ride to the top and access to the Observation Deck is FREE when dining in the Skylon Tower. We’re located at 5200 Robinson Street, in the heart of Niagara’s Entertainment District, and we’re open from 8am to 10pm. We hope you have a nice trip, and to see you next Fall as well!